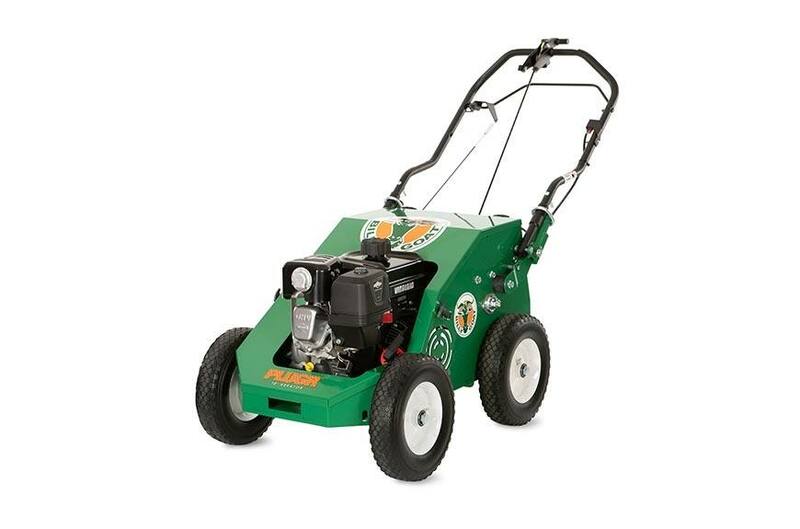 The 18" PLUGR is ideal for smaller property aeration or rentals. No add-on weights are required and reciprocating cam-driven tines propel the unit forward and drive cores up to 2.75" deep even in hard soil conditions, offering higher quality aeration than traditional drums. No-lift turning offers fatigue-free operation and a new ergonomic handle is Iso mounted for reduced vibration. A longer belt span improves belt de-clutching, increasing belt life. User Friendly Controls: Handle has fingertip controlled bail for engaging drive / tine. To raise and lower tines, the tine retractor lever is comfortably top mounted. One Piece Lift-Off Removable Cover: Offers ease of maintenance. Easy-release rubberized fasteners offer quick and easy hood removal for 100% access to all components. Four Tensile Hardened Thin Wall Tines: Simple, durable screw in design makes service quick and easy. In / out reciprocating tine motion produces less compaction on the inner surface of the hole compared to spoon designs. Updated Wheel Bearings: Prolong the life of the wheels. Easy Fold Handle: Handle folds for compact transport and storage. Iso Mounted Handle: Helps reduce vibration offering fatigue free operation so you can complete more work in less time. Longer Belt Span: Improves belt de-clutching and increases belt life. Text to Video: Feature offers quick view of operating instructions on your mobile device.